Monday, Aug. 17th marked the actual date of Cameron's birthday. We did have a few surprises planned. Chris and Jane took the day off of work and along with Ms. Ann and 'Auntie' Ronda, they ventured over to Five Guys for a delicious lunch where one doesn't count calories! While at lunch, Ms. Ann gave Cam one of the coolest gifts we've ever seen. She found a website (www.makeplayingcards.com) where you upload pictures to produce a deck of cards for playing card games or matching. Not only did she make 1 deck, but she made 4! After a hearty lunch, Cam and his entourage headed to the Algoma Fire Dept. Ms. Ann's son, Christopher, is a fireman and offered to provide a personal tour for the birthday boy! 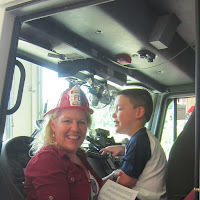 Inside the fire truck, Cam held onto the wheel so excited to be "driving" the big rig. He learned about the large hoses, all of the equipment housed in the trucks, and what the fireman wear. Christopher presented Cam wit his own Junior Fireman hat and a fire safety book. It's tough to determine who enjoyed the educational information and tour the most. It was truly a treat for us all. Many thanks to Christopher and Ms. Ann for an awesome day! 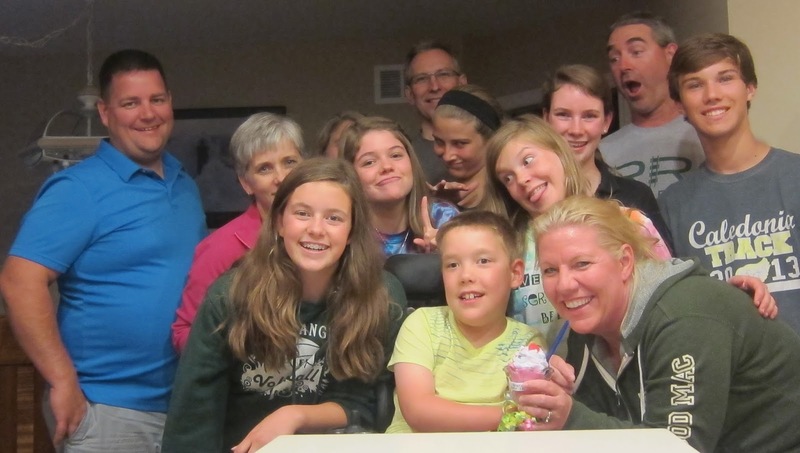 The 3 Families of "Forever Neighbors" all together. The very next evening marked our annual homemade ice cream contest between our family, the Raisch family and the Flegel family. The entries this year: Pirate's Treasure- Cam's entry of chocolate ice cream with different kinds of chopped up candy bars, Orange/Peach/Mango Cream- Raisch fam offering of vanilla ice cream with delicious fresh fruit, Caramel Pretzel Supreme- Flegel family treat of vanilla with caramel and chopped up pretzels. We feasted after dinner and many had multiple samples before voting for their favorite....and the winner....Pirate's Treasure! Cam was super excited, chanting "I win! I win!" On Saturday, we headed up to see Oma & Opa and our Lake Michigan. It was a perfect sunny day and we talked Michelle into joining us. The warm water and the waves made for some exciting kayak rides, one in which Cam and the girls had a wave lap right into their boat! Cam is used to seeing Michelle do a handstand in his living room while they've done their morning stretching this summer, but he'd never seen her perform the same feat so close to water. Michelle certainly impressed us all with her handstand skills while the waves lapped up to her hair. The beach sand became a construction site while Cam decided where new roads and lakes should be. Oma was his on-site supervisor.